A must-read for students in public administration and nonprofit management programs! 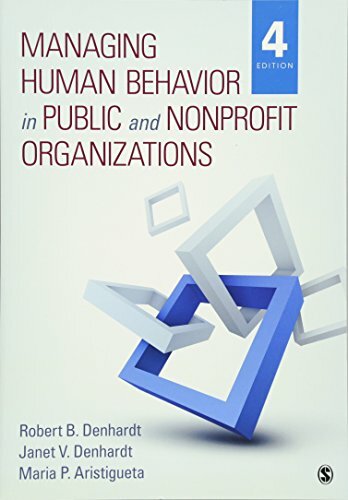 Managing Human Behavior in Public and Nonprofit Organizations, Fourth Edition, is designed to help students understand, manage, and influence the behavior of others in the workplace. Esteemed authors Robert B. Denhardt, Janet V. Denhardt, and Maria P. Aristigueta take an action-oriented approach by using real-world circumstances within public and nonprofit organizations to illustrate key concepts. Important topics such as stress,decision making, motivation,leadership, communication,teams, and change give students a foundational understanding of the basic issues that affect human behavior. In addition to new cases and examples from the public and nonprofit sectors, the Fourth Edition features new material on leadership and organizational change, cultural diversity and generational diversity, and positive organizational behavior.